Till the air everywhere now with joy is ringing. while you read these precious words. to English hymnody through his many inspiring texts. in Montgomery's newspaper on December 24, 1816. "Good Tidings of Great Joy to All People." and I will fill this house with glory, saith the LORD of hosts. Have a blessed and joyous Lord's Day! This is one of my favorite Christmas Hymns. Thanks for telling us a little more about it. The kittens are so cute! Wow! What an amazing choir!! At the end those angels really set the stage off. Beautiful, thank you for sharing the beauty and joy with us. I never knew that about this hymn. Those precious kitties put a smile upon my face this morning, just love them. I'm stopping by your blog for a greet and to look your nice posts! Stephanie, I have not seen yellow roses all Christmas season, and it was such a delight to see these. They look so pretty with the white and silver Christmas accents you have here. Your kitties must bring you so much joy. Have a peaceful Sunday, lovely Stephanie. Merry Christmas my friend, a lovely post. The is very lovely post! I just love listening to choir music, especially Christmas hymns. Beautiful. Wishes for a bright and blessed week. Your kitties are all adorable, though I'm partial to Buttercup. What a treat! Thank you so much, Stephanie. This song always makes me think of my brother. When we were kids, he played this song on the trumpet at church and I remember not having heard of it before then. THEN, I got sick of hearing it lol. But, now I love it again and it's one of my favorites. Now stop with those cute kitty pics because you are causing this dog lover to like cats! One of the nicer hymns that I've known since childhood. My heart did a little flip when I saw those sweet little kitties! Thanks for sharing this Stephanie - it's one of the songs that I have love to sing along with at Christmas time, and it's fascinating to know the history behind it. Buttercup,, Stripester, and Burrito are gorgeous. Have a really lovely week. 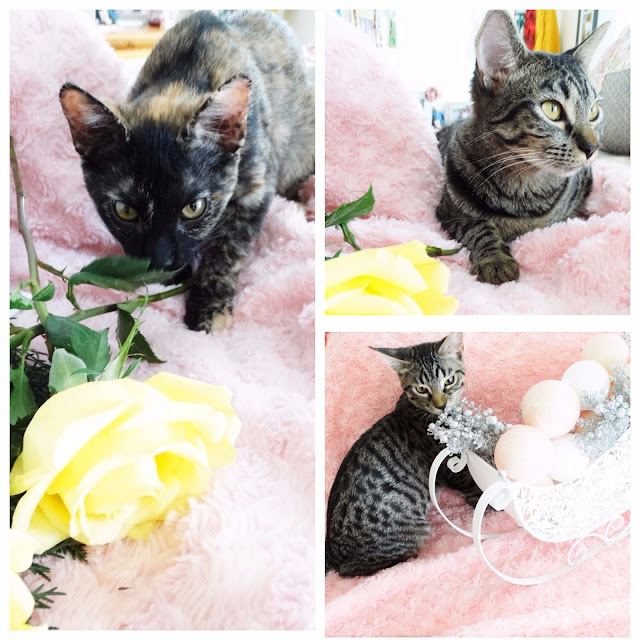 Love your beautiful decorations to go with this lovely Hymn, it looks like your furbabies are enjoying them also :) pretty pop of yellow with the roses! Hope your week is off to a wonderful start! beautiful stephanie, the kitties are super cute!!! A beautiful post dear Stephanie and your kitties are super adorable. That was beautiful! “Sages leave your contemplations” is a wonderful line. Such a beautiful song written, and I always enjoy the history behind the words. And those kitties, such little darlings they are, into everything it looks like, lol!